The Australian’s Judith Sloan is absolutely on fire at the moment. Here she is with another stinging analysis of Australia’s self-inflicted renewable energy calamity. If I read another press release about the millions of dollars of our money being handed over to the mendicant players in the renewable energy space, I’m going to scream. The latest was $100 million awarded to Macquarie Leasing to subsidise electrical cars. I’m not joking. So we hand over $100m of taxpayer money to Macquarie Leasing so it can offer concessional deals on top-of-the-line Tesla electrical cars to high-­income ­individuals, and the government justifies this as delivering affordable and reliable energy — and a low-emissions future, of course. Pull the other one, I say. The last time I noticed, electrical cars will be drawing power from our rickety, overpriced electricity grid. That is, electrical cars — which, by the way, have a very ­uncertain ­future in Australia; just ask any tradie or farmer — will be imposing additional demands on our electricity system. Josh, there’s no free lunch out there. Being in receipt of these press releases on a regular basis, can I just tell you that the amount of money that is being handed out to opportunistic green rent-seekers is out of control. We tend to concentrate on the implicit subsidies of the renewable energy target — at least $3 billion a year — but the country is awash with substantial grants to “green” players at both the federal and state levels. Another example I read about recently was a taxpayer handout to a company established to provide loans to households to install solar panels on their roofs. On the face of it, you might think this could be a good idea: low-income, cash-constrained households getting access to concessional finance to reduce their power bills. But that’s not what the company has in mind. Its business is confined to homeowners. You see, they are a better risk. And to think that taxpayers are assisting this cynical venture — well, it simply beggars belief. Obviously the subsidies that households with solar PV installations receive from other electricity users by virtue of unjustifiably high feed-in tariffs are not enough. They need more of these reverse-Robin Hood gifts. 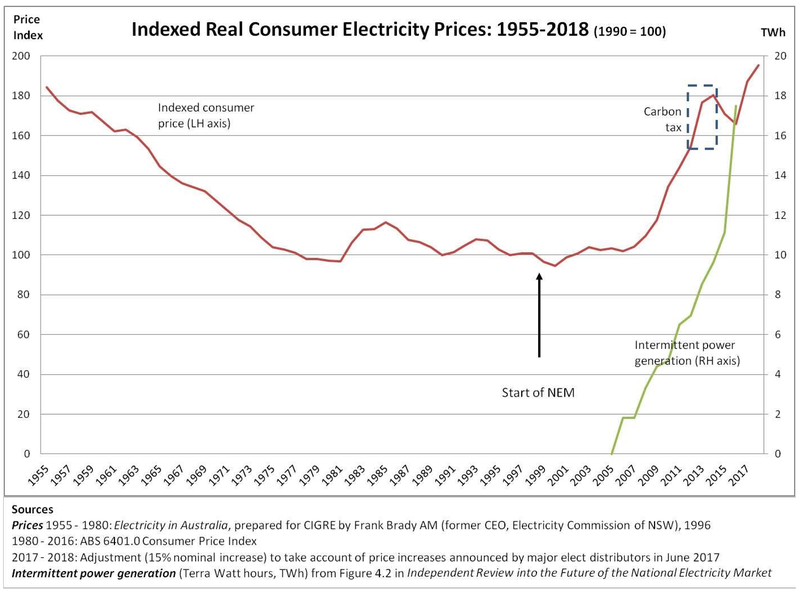 The crisis in the electricity market, the result of years of costly and defective intervention by federal and state governments, is only now getting the attention it deserves. We have gone from having close to the cheapest electricity in the world to among the most ­expensive. We have all the feeder stock we need — coal, gas and uranium — yet electricity prices have doubled in a decade. There have been some major porkies told about energy policy, such as the one about wholesale electricity prices falling upon the renegotiation of the RET in 2015. The assumption there was that there would be no retirement of coal-fired power stations until 2040. Yes, pigs might fly; it’s just unclear why the politicians didn’t cotton on. So where does this leave the government? It was a mistake to think AGL is on its side. The company is more than happy to use misleading advertising — we’re getting out of coal and the like — while securing more than 90 per cent of its profits from fossil fuels. Its aim is to milk these assets for all they are worth while pretending to be greener than Kermit. Whether it will sell the Liddell power station is anyone’s guess: the company may regard its exit as being in its commercial interest, and hang Australian businesses and households. Let’s face it, AGL (or any other energy company) doesn’t really care how high are electricity prices. And then there is the consideration of the clean energy target. Forget all that tosh about needing investment certainty: this is just code for a continuing subsidy arrangement for renewable energy. Judith almost appears to fall for the ‘software glitch’ story fed to the media by the wind industry and its parasites. That furphy started after the 28 September 2016 Statewide blackout in South Australia. After wind farms automatically shut down en masse, as wind speeds increased above 90 km/h (25 m/s), SA enjoyed one of its many wind-related ‘system blacks’. Thereafter, claims were made that the ‘ride through’ settings were not properly set. The reality is that wind turbines are automatically programmed to shut down when wind speeds exceed 25m/s. What Judith gets right is that it would not matter how many wind turbines are clustered across the Eastern Grid, when the wind stops blowing, the power stops flowing (see above). 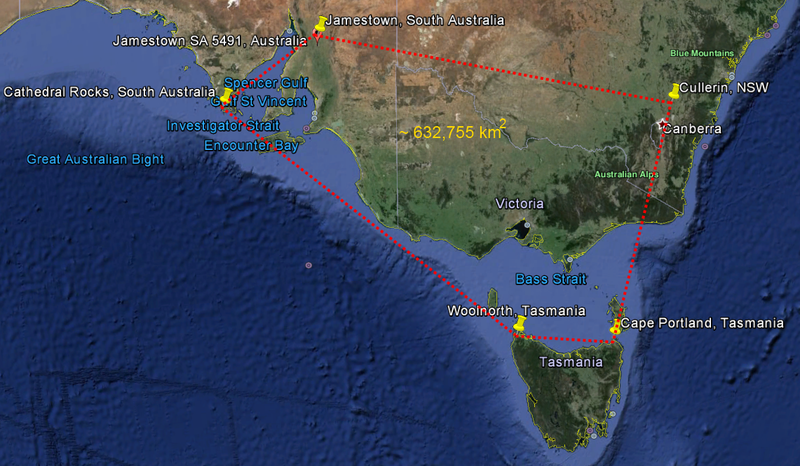 As depicted below, on the Eastern Grid Australia’s wind farms are located in 4 States – Tasmania, South Australia, Victoria and NSW – and spread from: Jamestown in the Mid-North, west to Cathedral Rocks on lower Eyre Peninsula and south to Millicent in South Australia; down to Cape Portland (Musselroe) and Woolnorth (Cape Grim) in Tasmania; all over Victoria; and right up to Cullerin on the New South Wales Tablelands. Those wind farms have hundreds of these things spread out over a geographical expanse of 632,755 km². That’s an area which is 2.75 times the combined area of England (130,395 km²) Scotland (78,387 km²) and Wales (20,761 km²) of 229,543 km². 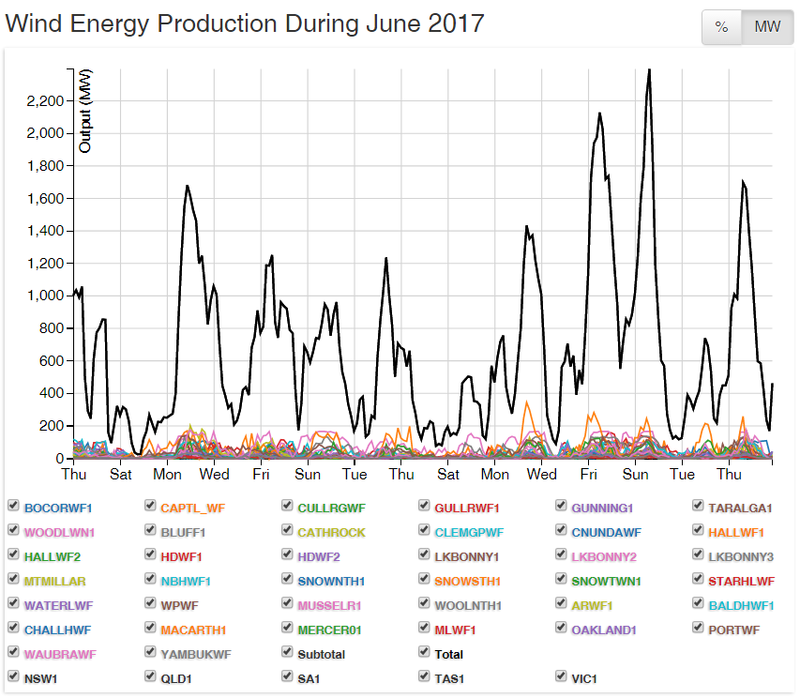 On something like 13 occasions during the month of June, the total output from all turbines was less than 200 MW (or less than 4% of total capacity); and on at least 6 occasions, less than 100 MW (or 2% of capacity). None of which has anything to do with ‘software glitches’ – unless Mother Nature’s operating system needs an upgrade? For grid managers charged with delivering more than 26,000 MW across the Eastern Grid every day, 200 MW is more like a rounding error. In fact, the grid manager does not even factor wind power into the long-term supply equation. The last thing Australia needs is another wind turbine. The last thing Australian power consumers need is more of the same. The Renewable Energy Target must go now. Well, well, well it looks, I say hesitantly that the penny might be starting to drop with the Liberals realising that the energy crisis will either make or break them. Barnaby and the Nationals have certainly come out swinging in demanding that no further subsides be given to renewables. South Australia’s energy minister was on the air waves this week and in about the only time I would agree with the Greek God of Renewables, he suggested the only reason the Libs are moving in on the closure of Liddell is because the energy crisis is about to hit Sydney. As for the cause, a delusional greeny is a delusional greeny you cant help it if your born dumb. They make no money out of renewables. It’s the rent seekers that make my blood boil. Pushing their renewables agenda and obscuring the facts whilst they fill their pockets whilst the average family suffers. I see the Ceres wind farm here on Yorke Peninsula was quietly given its third development extension by this busted arse state govt. Not that it will ever go ahead. I used to think the old man was a bit harsh we he suggested their should be public executions at half time of Crows matches.